My wife and I are originally from the German region of Hessen. Having always had a fondness for the mountains, we had spent many a wonderful vacation here. Now, at a time when our youngster is no longer dependent on us, we as your hosts would like to offer you the opportunity to experience wonderful vacation days in the Allgäu mountain world. Our aim is to continuously develop by collating and implementing the wishes and suggestions of our customers. You can rely on us: we will cater to your every need and ensure you enjoy an unforgettable vacation and gladly come back to stay with us again. Our hotel and our kitchen are oriented towards regional traditions. 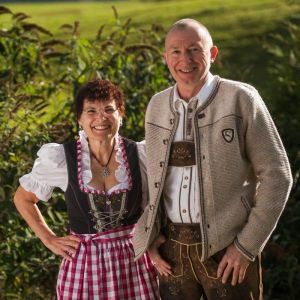 Our values do not include artificial dirndl-hype or pseudo-Bavarian oompah-pah, but rather continuity and honest hospitality.